When you start looking for dividend stocks, you'll need a plan to limit your stock list to the best possible companies. Dividend investing would be easy if all you needed to do was find a few high-yield stocks. But it isn't that simple because every dividend payer isn't equal. You'll need to make sure you're buying companies that can continue paying their dividends through thick and thin, which requires looking for a special breed of company. Here are four dividend investing tips that will set you on the right path. Investing is mostly about the future, but examining the past can tell you a lot about a company. 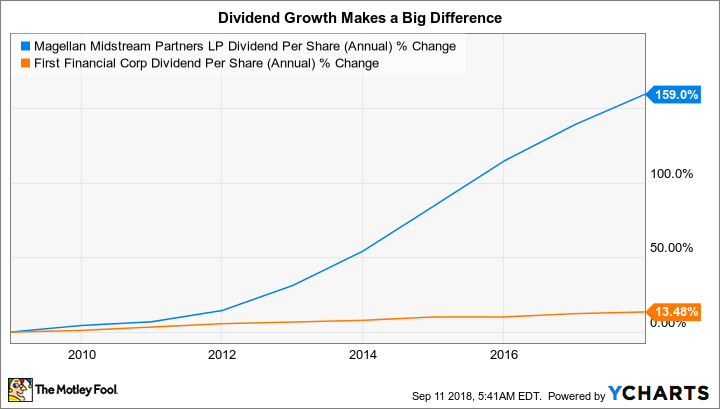 That's particularly true when it comes to dividends -- which is why, every month, I scan through the list of Dividend Champions, Dividend Achievers, and Dividend Challengers maintained by The DRIP Investing Resource Center. Champions have increased their dividends for 25 or more years, Achievers have increased annually for between 10 and 24 years, and Challengers have upped their dividends for between five and nine years. The best part is -- these lists are free. A long history of annual dividend increases shows that a company has made a commitment to rewarding shareholders via regular dividend hikes. Using this as a screen cuts down your possible options to just a few hundred names from the thousands of dividend payers that you'd otherwise have to sift through. It's a who's who of the dividend world, including such giants as The Procter & Gamble Company, The Coca-Cola Company, and ExxonMobil Corporation (NYSE:XOM), each of which have hiked its dividend annually for 25 years or longer. That said, some great names and opportunities won't be on these lists. For example, a company that has paused its dividend for a year or two (but didn't cut) will drop from the list until it's gotten back to five years worth of hikes. A good example of this today would be Royal Dutch Shell plc (NYSE:RDS-B). During the energy downturn, Shell didn't increase its dividend, but it didn't cut it, either. And now that oil prices are starting to move higher again, the international oil giant is starting to return more cash to investors via stock buybacks. Dividend hikes are likely to start up again in the not-too-distant future. This is why I regularly check the "changes" section of the lists noted above. This is where you'll find companies that have been dropped with a brief explanation of why. Sometimes, it's worth the extra work to find out more. The next step is to pick a few stocks to research from these lists. But what do you look for? If you're like most investors, yield is the first place you start. That's perfectly fine, since you need some way to identify candidates for further research. Choose a yield target that's right for you. My target level is around 4%. I scan the lists above and take a quick look at the stocks that are near or above that level. But I don't stop with the yield, and you shouldn't either. I also make sure to check the historical growth rate of the dividend over time. The one-, three-, five-, and 10-year dividend growth rates are available on the table, as well. A steadily growing dividend is great, but if that growth doesn't keep up with inflation, your buying power actually will shrink over time. MMP Dividend Per Share (Annual). Data by YCharts. Now look at Magellan Midstream Partners, L.P., a high-yielding midstream partnership with 18 years of annual increases and a trailing 10-year distribution-growth rate of just under 11%. Although I cherry-picked these two examples, the chart above tells you all you need to know to understand why dividend growth is just as important as yield. If you're looking for income, screen for yield, but also make sure to check dividend growth over time. At this point, you probably have a nice short list of stocks prepared for some deep dives. But what do you want to look at? I suggest you start with a scan of a company's balance sheet. Companies with a lot of leverage get into financial trouble more often than companies with little or no debt. Exxon and Shell are examples of this. Although Shell is a great company, it carries a lot more debt on its balance sheet than Exxon. When oil prices headed lower in mid-2014, both companies took on additional leverage to support capital investment plans and their dividends. With more leeway on the long side of the balance sheet, Exxon kept right on hiking its payout. Shell chose to hit the pause button, which was a stressful event for shareholders who use their dividends to pay living expenses. These are both good companies, and Shell has proven that it can manage its business with a notable level of debt (it tends to keep extra cash on hand as a counterbalance), but Exxon still was the energy company I chose to buy. 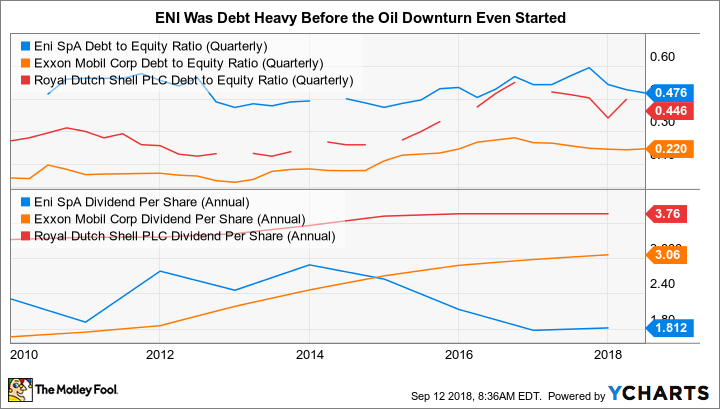 And then there's Italian energy giant Eni S.p.A., which made even greater use of leverage than Shell, and wound up cutting its dividend. You get the idea: Too much leverage is a bad thing. Eni debt-to-equity ratio (quarterly). Data by YCharts. That said, you'll also want to pay attention to the business you're buying. Simply put, does the company's direction and business approach make sense to you? For example, Altria Group, Inc. (NYSE:MO) has 49 years of annual dividend increases behind it and a fat 5.2% yield, but it sells cigarettes. Being a "sin stock" could exclude it from your list, but so, too, could the fact that its customer base has been shrinking for years. Generally speaking, cost increases have been driving dividend growth. However, I'm not convinced that Altria, no matter how impressive its brand portfolio may be, can keep raising prices to cover a shrinking customer base. Clearly it's doing other things to grow, like expanding into new tobacco and nicotine niches, but the business model just doesn't sit well with me. Creating these two screens is quicker than you think and can help you save a lot of research time. And you can use your common sense: Favor companies with low leverage and strong business models. Now that you have a small list of approved stocks, when do you buy? The answer for me is to start by looking at how the current yield compares to the company's historical yield trends. If a company has a 4% yield, but the yield normally has been around 6%, I don't do much digging -- it's priced at a premium. However, if the yield is 4% and that's toward the high end of its historical range, I get pretty excited. Exxon's roughly 4% yield today is toward the high end of its historical range, by the way. There are reasons for this, of course, but it has plans to deal with the issues it currently faces and the financial strength to see them through. 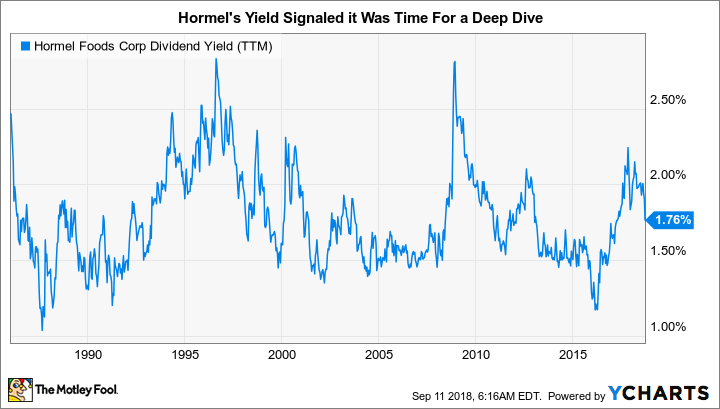 HRL Dividend Yield (TTM). Data by YCharts. This also is the step where I deviate from almost everything I just said. There are some companies that would pass every screen above except that they seem always to have yields that fall below my 4% cutoff. These are what I call my wish-list stocks, including companies like 3M Company and Johnson & Johnson. If the yield at either of these companies gets toward the high end of their historical range, I take a close look. That's exactly what led to my purchase of Hormel Foods Corporation when its dividend popped up to the 2% range. That's high for Hormel. When I coupled it with a history of mid-teens annualized dividend growth, I decided to step aboard. At this point, you have some basics to get you going when you look for dividend stocks. These aren't hard-and-fast rules because every investor is different. And as my purchase of Hormel shows, sometimes you have to bend the rules a little bit. However, they will help you avoid yield traps and financially weak companies -- which can help save thousands. By integrating these rules into your dividend investing approach, you'll be in a better position to make thousands because the rules will help you focus your attention on the best dividend payers -- which is what long-term income investors really want to own, anyway.